Deposit for up to 100 Free Spins on the new NetEnt slot! Enter the world of all things in cubic shapes on the latest creation from gaming powerhouse NetEnt and claim up to 100 free spins on Strolling Staxx: Cubic Fruits when you deposit at Mr Green until 26th January 2019. After opting in, you can simply deposit minimum €30 and will have the amount matched in Free Spins, up to 100 Free Spins instantly added to their account. Everything in the fantasy world of Strolling Staxx is just as it should be: cube-shaped. 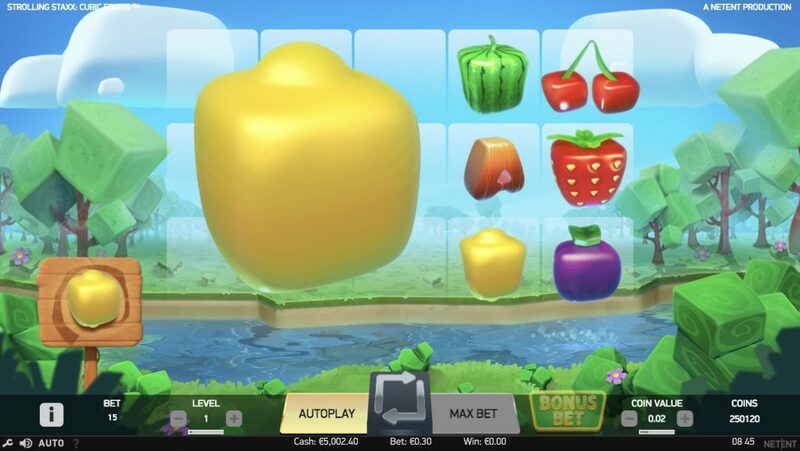 NetEnt has gone all out to create a wacky fruit slot with all things in cube form that reminds us a little of Wonky Wabbits with an added splash of Butterfly Staxx. Deposit today at Mr Green to try the new game with up to 100 free spins. OPT-IN on the promotion page is imperative to take part in this campaign, then deposit and wager €30 – €100 to instantly receive 30 – 100 Free Spins on Trolls Bridge, equal to the deposited amount. The Free Spins will be instantly credited to eligible accounts after the deposit is completed. Wagering requirement is 35x FS winnings, subject to the Mr. Green Bonus terms and conditions. Strolling Staxx: Cubic Fruits is a video slot with five reels, three rows and 10 fixed pay lines, featuring wild substitutions, colossal symbols, a Bonus Bet and a respin feature. The RTP of this is a low to medium variance game is set RTP of 95.98%. Activating the bonus bet results in an RTP of 95.95%. You can score a maximum win of 500 times your stake for a full screen of wild or melon symbols. A full screen can happen repeatedly in a respin sequence, taking the overall win potential past 1,000 times your stake. Bet sizes range 0.10 to 20 coins for standard play and 0.15 to 30 coins with the bonus bet activated.